Cleveland Indians first baseman Nick Swisher celebrates a home run with the 'O-H-I-O' cheer. Cleveland, OH — The State of Ohio is holding a gubernatorial election in 2014, and so are the Cleveland Indians. 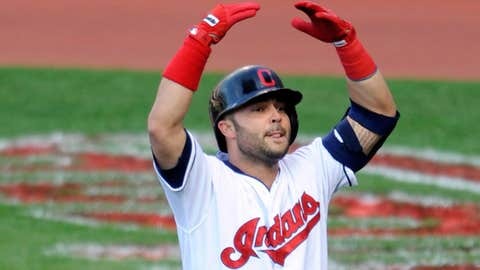 The club announced Monday that it is looking for a full-time Governor of "Brohio," the Nick Swisher-spawned section of Progressive Field (Section 117) that also went viral on social media throughout the summer months and the drive for the Postseason. Fans will submit videos at Indians.com/Brohio detailing why their fellow fans should consider them for the Governor role. Then, at least three finalists will campaign in an interactive event on the KeyBank main stage at Tribe Fest during the 4-8pm session on Saturday, January 25, where they’ll be asked questions by Indians personalities, including Swisher. Those finalists then will be placed into a fan vote on Indians.com, with that fan vote counting for 50% of the total vote. The other half of the total vote will be cast by Swisher himself. 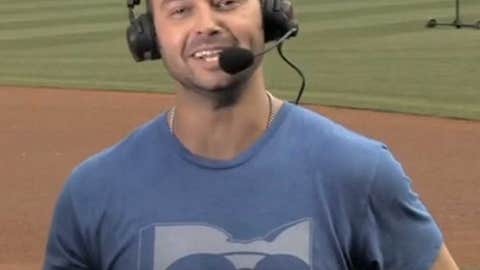 Nick Swisher sports a ‘Brohio’ t-shirt during an interview at Progressive Field. – "Bro-hio-ness": Do they exemplify the core values of Bro-ness? – Creativity: What will they bring to the Brohio Governor’s office that will help Brohio thrive and grow? – Leadership: how will they rally others to not only participate in Brohio and Bro-ness, but do so with passion and energy? – Lead Brohio cheers, encourage fans to rock their Brohio tee, create unique Brohio signage, etc. For more information on the contest, visit Indians.com/Brohio. The contest submission period ends Wednesday, January 15 at 8PM ET.